Lancets, or gauges, are thin metal strips used on face-to-face carpet weaving looms to ensure constant pile height. Before they were introduced on face-to-face looms they had been used on loop-pile looms (Brussels carpets). 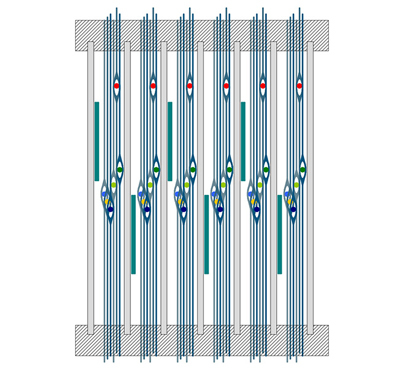 On loop-pile looms, pile loops are formed over a dummy weft resting on the lancet. 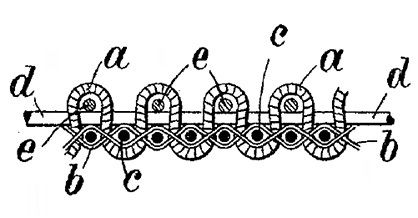 Usually the dummy weft is removed afterwards. This way of weaving loop pile was invented by Müllers & Spindler of Dülken, Germany in 1894. Instead of a lancet, a binding warp thread was used to support the dummy wefts. Already in 1904 the use of metal lancets is described in the patent of Wilhelm Förster from Chemnitz, Germany. Before steel that could be rolled into thin metal strips was invented early in the twentieth century, thin metal (piano) wire was used. Other materials, such as cat gut (which continued to be used to string tennis rackets many decades later), were also used. This is mentioned in a patent by Harvey and Harvey of England in 1934. To create higher loops, several wires could be stacked upon each other. A good example of this is shown in the French patent of Paul Girard in 1904. Lancets made of thin flat steel strips only became common after the First World War. This kind of lancet is used till today. They were used for example by Erkes & Krehbiel of New York in 1932. When steel quality improved, lancets became suitable for use on face-to-face carpet looms. Using lancets on such looms ensures constant pile height. Without the use of lancets, the pile yarn tends to pull the carpet top and bottom together, giving an uneven pile height. 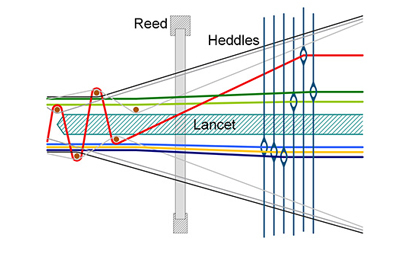 On 3-rapier looms, where lancets cannot be used (the lancet would be in the path of the middle rapier), this is a common problem. It can be worked around by shearing the surface of the carpet, but this leads to a loss of pile height of up to 10%, depending on how much shearing is required. The earliest patent showing the use of lancets on a face-to-face carpet loom is that of Émile Parmentier or Tourcoing in 1904. In practice, this technique did not become common until about 1930. 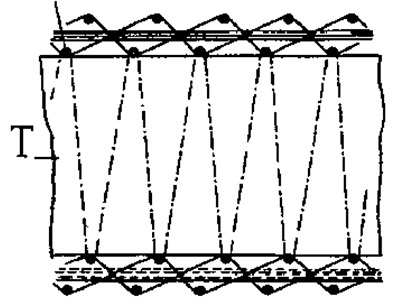 In 1928 Henry Howard of Connecticut used lancets on a face-to-face loom to weave face-to-face loop pile using two dummy wefts. Sometimes two lancets were used to create a cut-loop effect. On these looms the lancets only served to create loops and were not meant to ensure constant pile height. Such a system was patented by Vanoutryve & Renaux of France in 1928. 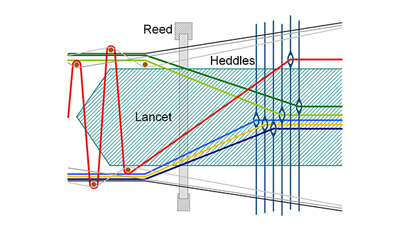 Lancets are an excellent means of keeping pile height constant, but they do have a drawback. Although they are thin (typically 0.3-0.5mm), they occupy space in the reed dents. On a loom with a reed density of 500 dents/m, the pitch of the dents is just 2mm, so even 0.3mm is significant. 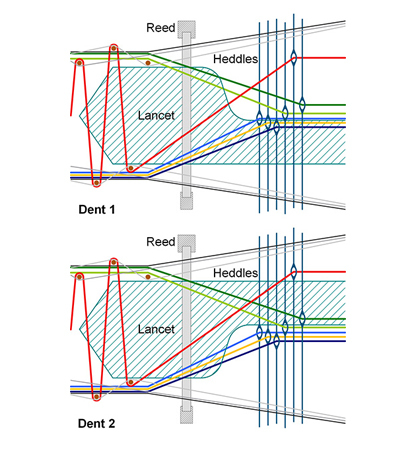 The lancets restrict the movement of the pile-thread heddles. Several solutions have been patented to solve this problem. 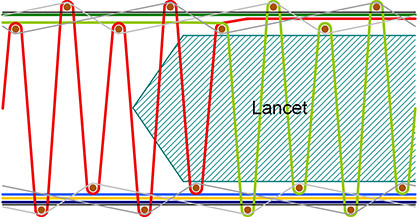 The most common solution is creating a recess in the lancets at the location of the heddles. This leaves extra space for the heddles of the pile yarn. For very low pile heights (3-6mm), the heddles can also be positioned below and above the lancets, giving the same result. Weaving carpets with such low pile always requires lancets. The slightest variation in pile yarn tension would pull the top and bottom carpet together and the pile knife would then cut into the backing fabric. 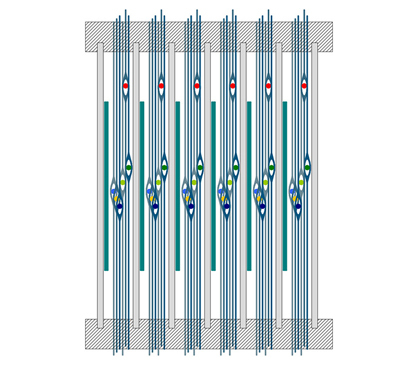 This solution – low lancets with the heddles positioned below and above them – is used on the Stäubli Alpha 500 weaving systems for low pile. With the LX2493 Jacquard machine, weavers can level the pile-yarn heddles in the middle position so that they are above or below the unique Schönherr low lancets. The pile-yarn heddles, except the one in patterning action, are not hindered by the lancets. This solution offers constant pile height plus maximum freedom in weaving (as if without lancets) – for minimum shearing loss and perfectly even surfaces.